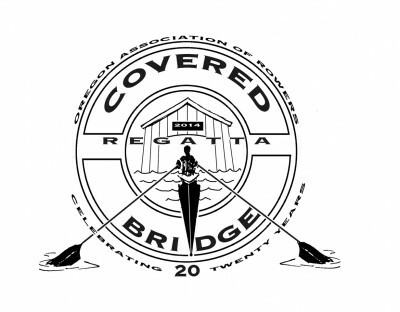 It’s our 20th Anniversary of the Covered Bridge Regatta and you are going to want a t-shirt! This fabulous design was created by Lex and Debbe (OAR Master rowers)! 1) Entries close at midnight on March 31st. All entries (except those on the waitlist) not paid in full at that time will be considered late and will be accepted only as they are paid (at 150% of the regular fee) and only if space is available. Waitlisted entries will have priority over unpaid entries. 2) Email notification of waitlist acceptances will be sent beginning on April 1st (to the address listed on your entry). Acceptances must be confirmed and paid for promptly (within 24 hrs) or the acceptance will expire and the lane will be offered to the next crew on the waitlist. Check your email. 3) If you no longer wish to be on the waitlist, please remove your entry now. If you wish to scratch an entry, please do it now. 4) Please update and pay for the number of athletes attending (at $2/rower) on regattacentral. This is an Oregon State Parks Fee that we pass along directly to the state. Near real time results will be available over twitter and via OARowing.org. On Twitter, either follow OAR_CBR or look for the hashtag #CBR14. Parking will be very tight again this year. Please plan on parking in the town of Lowell and riding the free shuttle bus or walking to the park. Trailers must have a reservation for space at the marina (kenmarij@centurylink.net). Although many have parked along Pengra Road in the past, the Sheriff is free to ticket and tow these cars. We recommend you not park on the road. There will be no RV parking at the park. See OARowing.org for other options. Lodging: Last we looked there were still a few rooms available in homes in the town of Lowell (rmgeorge513@aol.com). There are also a few tent camping spots left at the park. In order to accommodate more racing, we are going to try something different next year. The collegiate CBR will be held on Saturday April 11th, 2015. The masters and juniors CBR will be held on Saturday and Sunday April 18th and 19th, 2015. We hope this will allow us to offer more events and allow full participation in the events we do offer. If your club has a particular event you would like to see added in 2015, please email (now, while you are thinking about it) regatta_entry@oarowing.org. Include CBR15 in the subject.